Last month’s Annual World Bank Conference on Land and Poverty brought together over 1,200 participants from across the globe—including representatives from governments, academics, civil society and the private sector. It includes discussions of new research, innovations, practices and policies to strengthen land and resource governance. USAID presented on key findings and lessons learned in land matters from across the globe, including responsible investment, land and customary tenure, sustainability, economic growth, women’s empowerment and much more. You can view the presentations and download papers from USAID and our implementing partners on this event page. USAID also participated in a high-level round table discussion entitled “Regularization of Rural Rights: Lessons Learned from Ethiopia, Liberia and Zambia” that featured speakers from USAID, the Ethiopian Ministry of Agriculture, the University of Zambia, Namati and the Liberia Land Commission. 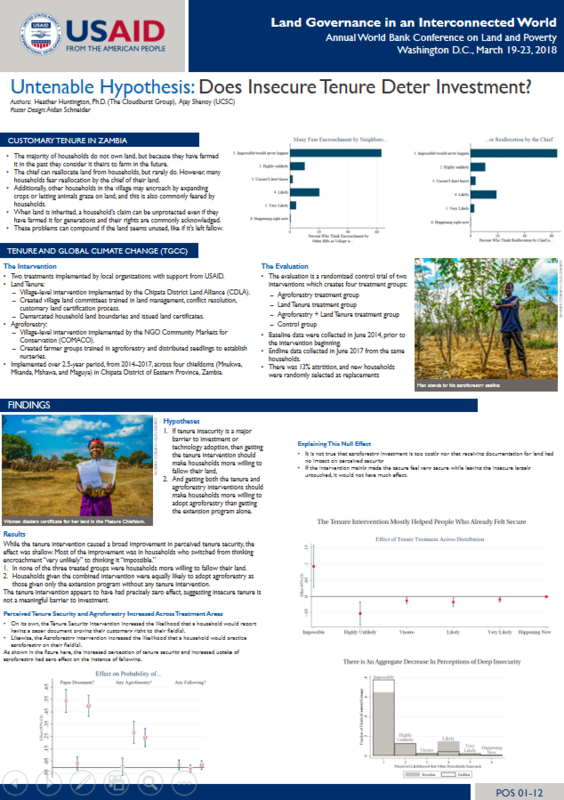 Highlighted below are three of the posters that hung during the conference, featuring additional cutting-edge research and key-findings from USAID projects across the globe. Data used in the posters and the presentations and papers can be found on LandLinks and is available in the Evaluations and Research section of the site. Additionally, be sure to view this data visualization from a rigorous impact evaluation of the Tenure and Global Climate Change (TGCC) project in Zambia (2014-2017). 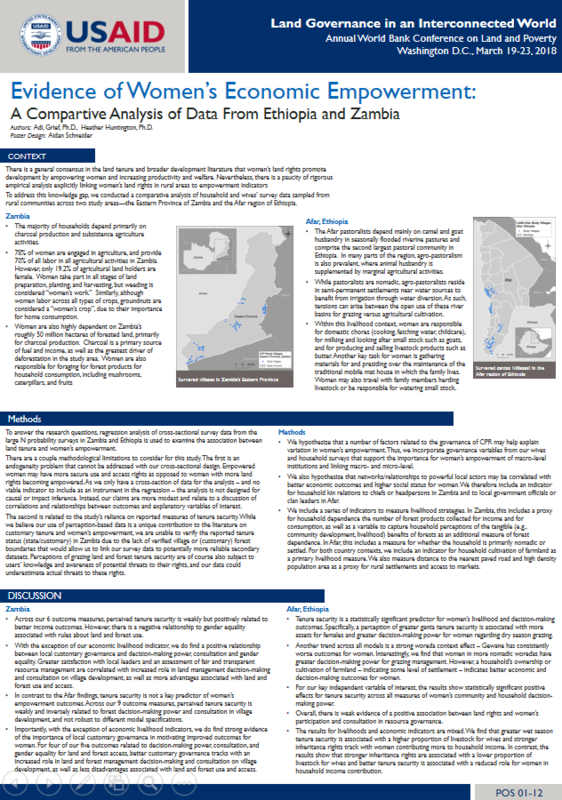 This poster explores the relationship between customary governance, customary tenure security and women’s empowerment using two large-scale representative surveys from Zambia and Ethiopia. This poster provides rigorous, microeconomic evidence on whether weak property rights prevent households from adopting new technology. We evaluate USAID’s Tenure and Global Climate Change (TGCC) intervention in Zambia that cross-randomized an agroforestry extension with a program to secure customary land tenure to smallholder farmers. 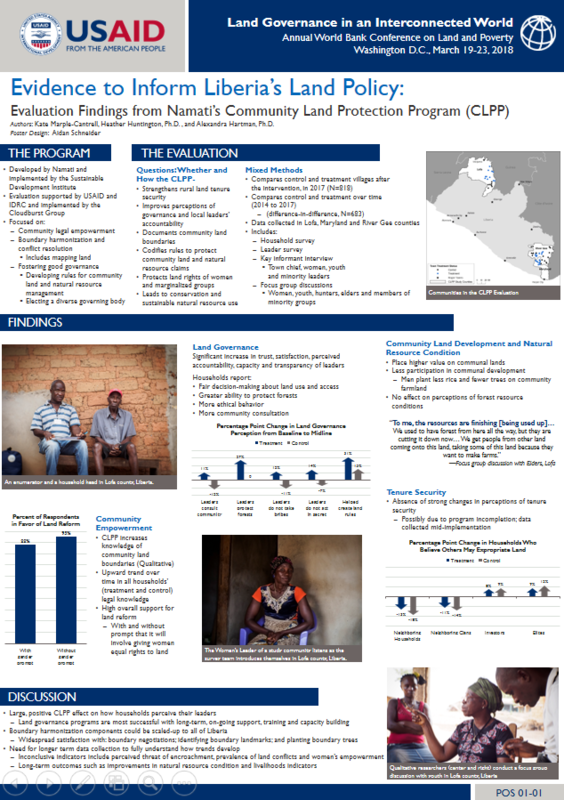 This poster presents midline results from a rigorous evaluation of the Community Land Protection Program (CLPP) in Liberia. CLPP supports communities to leverage community land documentation processes for positive intra-community changes, leading to enhanced local empowerment, resource governance, and livelihoods.